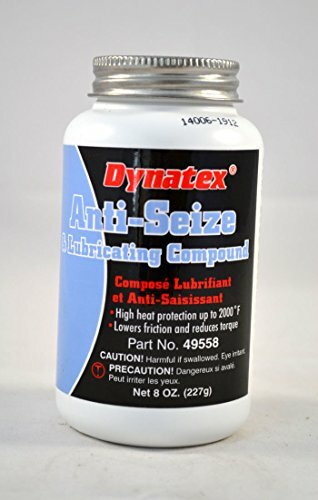 Dynatex anti-seize is a heavy-duty, economical industrial anti-seize and lubricating paste containing very finely divided metallic particles in a special no-melt petroleum base grease. It leaves protective film that seals and protects metal parts even under the most extreme conditions heat, pressure, and steam and water exposure. Dynatex Anti-Seize is not just another ant seize/ thread lubricant. Unlike conventional products on the market, the maximum blend of metallic solids has been homogenized into a specially designed petroleum base grease, which does not contain clay or soap base thickeners. This helps to provide a superior product that will not melt and run out after application. It also helps to reduce friction of metal surfaces and allows easy movement of threaded connections during assembly and disassembly, which makes for tighter make-ups. Other advantages include: Protects up to 2000 degree F. Prevents carbon fusion. Non-melting. Chemical resistant. Prevents rust and corrosion. Excellent lubricity. Extreme pressure lubricant. Steam and water resistant. Reduces torque. Prevents galling and seizing. Application: threaded fittings, winches, valve shafts, casting equipment, conveyors, rig drives, sprockets and chains, manifold studs and bolts, brake cams and pins, splines and worn gears. Storage and shelf life: When stored in the original unopened containers at or below 90 degree F (32 degree C). Color: silver grey. Base oil: petroleum. Thickener: synthetic. Texture: buttery. N.L.G.I. grade: 1. Flash point: 430 degree F. Operating temperature range: -60 degree F to 2000 degree F. Suggestions of uses should not be taken as inducements to infringe any patents. ISO Certified. If you have any questions about this product by Dynatex, contact us by completing and submitting the form below. If you are looking for a specif part number, please include it with your message.